I have just returned from a pilgrimage to the wondrous west coast of Ireland, led by Christine and John Valters Paintner. It was a fabulous, rich, deep experience which I'm sure I will be savouring for some time to come. This book is also one to savour. I loved the way that Christine and John connected their own life experience to the themes of being a pilgrim. I loved Christine's description and vocabulary for the practice of lectio divina: lectio= notice what is shimmering for you; meditatio= savour the word/phrase/image; oratio=what is being summoned out of this experience of prayer? ; contemplatio=sink into the experience of stillness. I read this book to prepare for a Celtic Pilgrimage. It actively involves the reader in preparation for the pilgrimage by including practices such as reflections, readings, lectio divina, prayers, midrash, walking, and photography. I was new to pilgrimage and it helped me understand my yearnings and intents. It also helped me understand the concepts behind a pilgimage, such as letting go, crossing thresholds, being uncomfortable, and embracing the unknown.An excellent source for me, but I would reread it if I were going on another pilgrimage. Great book for self-directed retreat! What does it mean to be a pilgrim on a pilgrimage? The Soul of a Pilgrim seeks to answer this question with us. Being on a spiritual journey is not new to most but to define yourself as a pilgrim is more than just being a traveler. I would say it is by way of seeking that makes the difference. The author speaks of letting some things find you and not to push to hard to understand but let it wash over you. I enjoyed the juxtaposition of the story of the physical move of the author to Ireland and her inner spiritual journey. The book is more about being open and taking chances. I liked the creative praying the scriptures with immersing yourself into the story and speaking interiorly with the characters. I also, liked the photographic walks where you receive photos instead of taking photos. Using photography as meditation was a new concept to me and I love photography. I thought the biblical reflections by John Valters Paintner, the authors husband was the best part of the book. The introduction seemed a little new age like with yoga and meditation for me, this traditional Catholic. The reflections are explaining how to do Lectio Divina, which is a very Catholic way of prayer and bible study. The writing exploration through midrash is an ancient Jewish practice of explaining problems encountered in bible study. There is a part in Chapter 6 of the book about being okay with feeling uncomfortable. That may be a way of realizing something you need to learn and this spoke to me of letting things happen and not pushing so hard. I’ve been so schooled on making things happen that letting things wash over you is foreign to me. Intentional silence and intentional letting go of control is freedom. My favorite line in the book is “All of the feelings I encounter that make me want to slam the door on my inner life, these are precisely the place we are called to meet God”. Mrs. Painter goes on to say “I hope you see that much of our lives rest in the space between loss and hope. Our lives are full of Holy Saturday experiences.”I would recommend this book to you in beginning spiritual exploration and bible study in Lectio Divina. I was definitely left wanting more which is a good thing. Genre: Religion and spiritualityThe author has structured the book into eight segments of spiritual guides designed to assist the reader on an inner pilgrimage. Excerpt from the book:"Missing you" scrawled on a postcard sent home, but you don't follow with "wish you were here." This is a voyage best made alone. Chapter 1 "The Practice of Hearing the Call and Responding"The first chapter deals with the concept of the discovery of our true selves after stripping away all self-deception, self-criticism, self-inflation, masks, expectations and judgments. Loss of a job, health, a friend, a sense of identity, financial security or a marriage can be acknowledged in sorrow - acceptance of the loss can lead to renewed vision and life. The author takes a page from the "one door closes, another opens" school of thought.Chapter 2 "The Practice of Packing Lightly"Traveling teaches us what essentials need to be packed and carried along with you. You also learn what can be left behind to lighten your load. The same principal applies to our spiritual baggage as we start on the pilgrimage. You have, in your power, the ability to decide which attitudes, beliefs and expectations can journey along with you and which one can discarded. Less truly is better, baggage of any kind is heavy. Chapter 4 "The Practice of Making the Way by Walking"Excerpt:"On a true pilgrimage, we soon discover that the journey has its own rhythm and momentum. We realize, if our hearts are listening, that there are secret destinations that reveal themselves as our path unfolds. "The author discusses a means of letting go of trying to maintain control over our lives. We are advised to let spiritual wisdom guide us safely on our way.The eight guides are thought provoking and profound steps to complete the spiritual journey. Our journey is a lifelong voyage.Excerpt:"The journey transforms us so we may be ready for our destination. "I highly recommend this book.ARC courtesy of the author and publisher via NetGalley in exchange for an honest review. As someone who has embarked on the Journey Within for some years, the experience of reading The Soul of A Pilgrim was singularly powerful for me. As I read about each of the eight practices, I instantly recognised a time in my own journey where I had been called to take up that very invitation. These eight practices of Hearing the Call and Responding; Packing Lightly; Crossing the Threshold; Making the Way by Walking; Being Uncomfortable; Beginning Again; Embracing the Unknown and of Coming Home feel simultaneously deeply familiar yet tantalising new.This is a beautifully contemplative read. It is meant to be pondered upon and prayed with. Each chapter is accompanied by suggestions for Lectio Divina, a writing exploration (Midrash), and a Contemplative Photography exercise. Each chapter is also brought to a close by a profound and beautiful reflection based on a Scripture passage by John Valters Paintner - the author's husband. If you are someone who has been feeling the tug to "enter within"; if you are someone who desires to explore the interior landscapes of your own soul and to begin what the saints variously refer to as the journey into the Interior Castle (St. Teresa of Avila) or the ascent to Mt Carmel (St. John of the Cross), this book could be a your guide. Filled with references to scripture, poetry, and the sayings/writings of saints, and written in a deeply contemplative and loving spirit, this book is a prayerful retreat experience waiting to be had.Pilgrim, do you hear the call? Come! I am a daily practitioner of centering prayer. Silent prayer is a special time for me. I need silence. Christine's book, The Soul of a Pilgrim, came along at a perfect time for me. This book has both complemented and deepened my contemplative practices.Christine's book has taken me on a pilgrimage. It has challenged me to explore new contemplative practices. I have rediscovered Lectio Divina. Previously, I was just not able to do it. I now find that I can! I have added Lectio Divina to my daily practice.I also plan on reading her book, Eyes of the Heart: Photography as a Christian Contemplative Practice. I enjoy photography. I also want to incorporate photography into my contemplative practices. (Christine mentions contemplative photography within each chapter. )I love this quote from her book. "Each morning ask where you need to begin and start there with humility, compassion, and with holy anticipation." This is excellent advice. This is how I now try to begin each day.Read The Soul of a Pilgrim! You will not be disappointed! 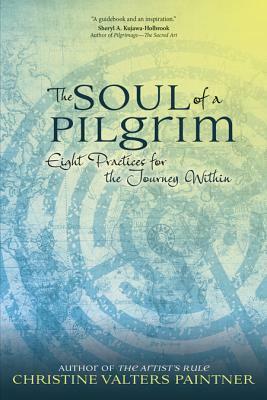 Beautiful book for those preparing for pilgrimage, either physically or spiritually. I go back again and again to read my highlighted notes. Love her perspective, made me think more deeply. I came to this book seeking to discover the "meaning" behind a pilgrimage. Did I need to travel on a physical journey in seeking to find whatever it was I'm seeking or simply to experience one each day with Jesus? Call it a yearning, for something more. To experience more of God, to realise a life fully immersed in surrender to Him. This book helped bring clarity in such a gentle way.Christine Valters Paintner mirrors her spiritual pilgrimage with the physical one that she and her husband have experienced in recent years, firstly in moving from the US to Austria and then onto their current abode in Galway, Ireland. This is one of those books that lingers in you. In a really good way. I borrow this next paragraph from another reviewer (unfortunately they go by the anonymous title of "Amazon Customer") as she wrote it so well:"The book describes eight practices to help the pilgrim on the road. Don’t worry, these are not eight ‘disciplines’ designed to break the back of those with a less than iron will - think of ‘attitudes’ that need to be nurtured and grown. We don’t need to come to this book already ‘perfected’. Rather we come as learners, ready to traverse the spiral as many times as it takes. "Funny that, a visiting pastor described the other day our spiritual walks as not being linear rather in "loops" which supports one of Paintner's concluding remarks: "We sometimes think of the journey as a linear path to travel, when in reality we travel more in circles and spirals. "Paintner grabs inspiration from the desert monks who left civilisation behind to experience an "unhindered" perspective of God. "They yearned for an experience of God beyond the boundaries of what they had known. They let this desire lead them to wild edges." This is my desire and working through this book has helped me realise the importance of "dive[ing] into the waters of life to see where the current carries us. "For too long I've held back; by fear, uncertainty and anxiety. But Paintner describes similar concerns throughout her pilgrimage. But it's usually the scariest decisions we make that are the most fulfilling especially when we feel completely ill-equipped. And that's the point: to feel ill-equipped. Because that makes us depend on our Creator who so desires to actively walk with us and equip us with whatever we require to discover Him in all His fullness.This book was written after Paintner had run some workshops that aided in the formulation of her premise. Further, her husband John contributes some reflections on well known Biblical passages in each chapter. We then get two practical exercises to engage in. The first, Lectio Divina using the passage John references and we're encouraged to join the scene and write our personal experience (Midrash) of it. Some examples taken from the workshops are provided which I found enlightening. The second practice is creative exploration using photography by venturing out on a contemplative walk each chapter using the Biblical story as inspiration to capture images reminiscent of that story.So, no, I don't need to leave home even though one would be fun. Who doesn't love to travel? But I can take the same pilgrimage every day as I dive into it, hand-in-hand, with Jesus exploring all there is available and learning the power of love in all my interactions.Highly recommended. Christine Valters Paintner - Christine Valters Paintner, PhD is online Abbess at AbbeyoftheArts and the author of nine books on contemplative practice and creative expression. She lives in Galway, Ireland where she also writes poetry and leads pilgrimages on the wild west coast with her husband John. Christine is a Benedictine oblate, living out her commitment as a monk in the world.